In Florida, the warm climate and abundant nature invites to a light diet and strongly bound to the context. A very common fruit is the avocado, which you can also find in Italian supermarkets. Is hight in potassium (more than bananas) and vitamin E and B1. The recipe that I propose it can be used as a starter in an important meal or as a snack during a cocktail with friends. If you add some cheese bites on the side can be a dinner. In the U.S, these shellfish are for sale only in this way, without that little appendage that is the orange coral. You can safely leave the coral attached because it is very good. Peel the avocado, remove the large central seed, cut into pieces and whip by adding the juice of half a lemon. In a bowl mix the smoothie with yogurt. Add salt and pepper. Heat a frying pan and when hot cook well (without any dressing or oil) scallops, two minutes per side. Add salt and pepper. 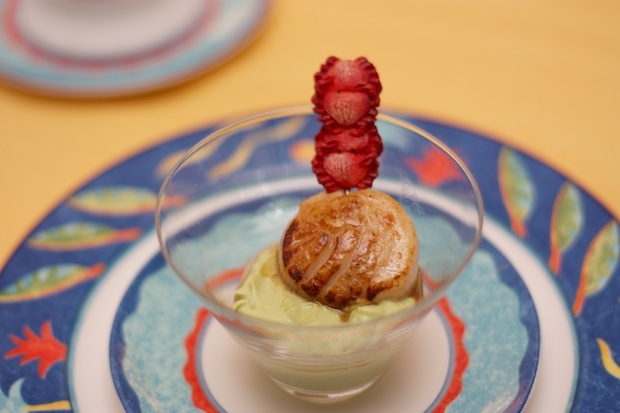 Place in a martini glass a spoon of avocado cream, put he scallops in a small skewer and place it on top of the cream. Serve immediately.